Chewy and soft carrot cake cookie with cinnamon, nutmeg and ginger spices topped with a cream cheese buttercream and pecans. Let these cookies be the first thing you guest smell when they come walking into your house during the upcoming holiday with the spices in the cookies. Carrot cake cake has to one of those cakes that I actually likes growing up, I was a picky eater growing up so you couldn't get me to eat anything that a vegetable in it. It might be that the cake or cupcake is topped with a thick layer of buttercream, which is my favorite part of any cake. 1. In a large bowl, cream together butter and brown sugar for 2 to 3 minutes or until light and fluffy. In a separate bowl, whisk together flour, cinnamon, nutmeg, ginger, baking soda and baking powder. Set aside. 2. Add vanilla extract then add eggs in two parts and flour mixture in three part. 3. Fold in shredded carrots then cover bowl and chill for 1 to 2 hours. 4. Preheat oven to 350 degrees and cover cookie sheet with parchment paper. Scoop 2 tablespoons worth of cookie dough and place on the cookie sheet at least 2 inches apart for spreading. 5. Bake in oven for 10 to 12 minutes or until lightly golden brown. The cookies will still be soft in the middle but that will set as it cools. Let cookies cool of cookie sheets for 10 minutes then transfer wired rack. 6. For cream cheese buttercream: cream together butter and cream cheesecake until light and fluffy on high. Add in vanilla extract or vanilla bean paste and salt. Lower the speed of your mixture and add in confectioners' sugar a cup at a time. Scarping the sides after adding each cup. 7. Once cookies are cookies, spread 1 tablespoon buttercream on each cookie and sprinkle of pecans, if desired. Enjoy! Store in a plastic container in a cool place. These look so incredible delicious! I'm a big fan of carrot cake, but I've never tried a cookie version of it. I'll have to give these a try! I love carrot cake so I will have to try this recipe! Your buttercream frosting and pecans on top sound wonderful! OMGoodness these sound and look delicious! I love carrot cake, love spice cake and can't get enough cream cheese foods. I will love these. I must make them while I have guests over though so I don't devour them all. Oh, this carrot cookies look amazing! And I love how easy the recipe is! I have never tried a carrot cake cookie because I have never knew they exist. Maybe you invented it!! 😱👍🏼😍This looks delicious as carrot cake is my fave!! Ooh carrot cake cookies?! They sound incredible what a great recipe to share. I really want to give it a go myself. What a fun idea! I didn't like carrot cake growing up, but now it's quite a treat! I can almost smell the goodness coming off the computer screen. I will just oogle your page though, because I cannot bake and I have given up trying (lol my family actually begged me to stop). These look yummy! I do not really like carrots, I normally only use them in soups but this looks delicious. I'm a huge fan of carrot cake and I must say, these cookies are definitely a must try! I love that they're chewy as well, that's my kind of cookie! I could try to do something that is vegan soon. I actually never had carrot cake in my life believe it or not but the way you made it looks absolutely delicious! I think I'm going to make it myself and finally try carrot cake :))) Thanks for sharing! You always have great looking recipes! I love carrot cake but I have never tried a carrot cake cookie. I would love to try this, it looks so delicious. Ohhh yum! These look seriously yummy. I am super into carrot cake these days, so I've got to give 'em a shot! We love carrot cake anything but cookies are definitely my favorite. These would be so great for Easter tomorrow. I'm horrible with baking, but I r e a l l y want to try my hand at these, they look so yummy! This is excellent, I've been dying to get the kids here into carrots. They're already there but something's just missing. I think it's now close to perfection in a form of these treats. Awesome recipe! This looks delicious! I'll have to try out this recipe one of these days. Woah! This looks really delicious. I love the smell of freshly baked cookies everytime I visit my parent's home. I would also agree that this is a creative way to enjoy veggies. Thank you for sharing the recipe. Will try this soom. I love a good, chewy cookie! I like carrot cake okay, but it sounds so much better in chewy cookie form. I’ll be trying these soon! I'm obsessed with carrot cake. My wedding cake was even a carrot cake. These cookies are going to be a big hit in our house. I accept making these! Delicious! :) Thanks for sharing the complete process. Carrot cake cookies sound so good. I love the aromas of fresh baked cookies in the house. I can't do it. I can't put carrots in my sweets. lol. But my family loves it and it's a way for me to sneak the veggies in, so that's a plus. such a yummy treat! I'd love to have this for a sweet afternoon tea party! it will be so perfect with it for sure! Gosh these look and sound so good! Perfect for Easter too. Obsessed! i love all things carrot cake related. These are a great way to get carrot cake on the go. I had never heard of carrot cake cookies. I sure they would be a hit at a get together. I've never had a carrot cake cookie, but I know I would love these. They look delicious and carrot cake flavor is wonderful. OH how awesome is this?? I love carrot cake I definitely have to try this recipe out! Thanks so much! Two of my favorite ingredients are here which are "ginger" and "pecan nuts". I would definitely love to eat this. You carrot cake looks really good I can't wait to try this at home! Wow this sound absolutely amazing. Carrot cake is my favourite and cookies are great so really this is the best mix ever! Can't wait to try them! Carrot Cake is ONE of my favorites and I NEED to make this, bookmarking now to make this weekend! Anything with the word "chewy" in it sounds like something I want to try! I love a good textured cookie! I think carrot cake cookies would be amazing. I can't wait to try out this recipe. Delicious! I totally feel ya on loving carrot cake cake!!!! And now it’s a cookie with a big dollop of cream cheese buttercream frosting. Heaven!!! Thanks so much for the recipe. I can’t wait to try em! This looks so delicious! I love baking but haven't tried this before I didn't know we could add carrots in a cookie. Love it! These look amazing! Cannot wait to make these! Pinned these for the weekend. My mouth is watering just looking at these beauties! They look sooo good! I am not usually a fan of carrot cake-type things, but these cookies have my mouth watering! I love carrot cake, and I love cookies. You really can't go wrong with this recipe! What a great twist to the carrot cake! MMmmm these look great. I will definitely want to try that frosting! I think the vanilla bean would be a great flavor, and I love the black speckles. Yum. Wow this looks really good! My favorite part would probably have to be the frosting. I might have to check these out for myself. u always got the most interesting mix of ingredients! this is surely unique! I am not usually a carrot cake person, but I think I could get on board with these cookies! My mouth is watering just looking at the pictures! I'll definitely have to give it a try this weekend! Wow these look amazing! The pictures alone just make me want to stop everything and make them! Yum! I love carrot cake. Plus we all known that carrot has a lot of benefits, it makes the cake more delicious and healthier. You recipes always look so delicious! I'm actually not a huge carrot cake fan, but I would totally bake these cookies and devour them in one sitting. I don't know why but I didn't realize you could make carrot cake cookies. I am sooo willing to try these out. This carrot cake cookie looks so yummy. I would love to make some. This looks and sounds amazing, I bet it taste great too. Ooo! 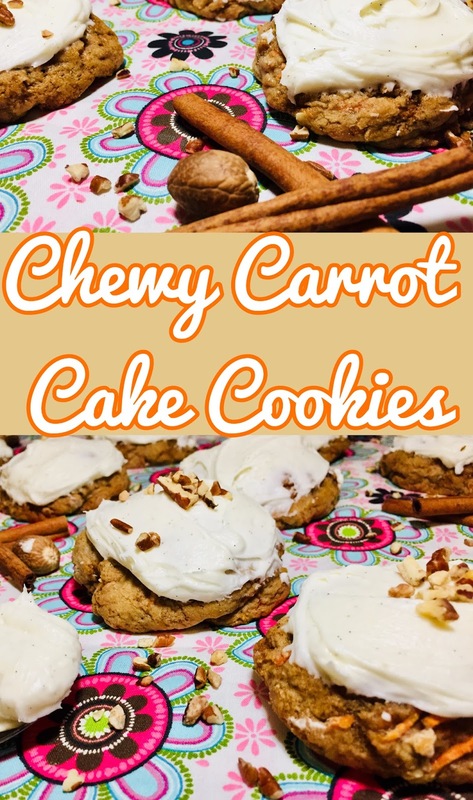 I love carrot cake everything and these cookies look amazing -- especially with that yummy frosting! Nice! What a yummy way to eat more carrots! Ooooh I like the idea of a chewy carrot cake - a nice twist that looks delicious! This really looks yummy. Though I really never tried any carrot cake. But want to give this a try. Omgosh! These look so fab and I'm a carrot cake fiend! I would love to try it out as I wanted to know how chewy it can be. I love cookies that are chewy and also addicted to them. Every time I come to your site Luci I get so hungry. LOL!! Absolutely love carrot cake anything and these sound so delicious as a cookie - Count me way in trying to make these real soon. Thanks always for your scrumptious recipes! These look like heaven on a plate! I can just imagine how amazing your home must smell when you're baking them!